2013 marks the centenary of Francois Krige’s birth and it is therefore appropriate that The Benediction of Shade exhibition includes a delightful selection of tree drawings and paintings by Krige. The Benediction of Shade is a group show of works related to the metaphors and imagery of trees and work by over 25 artists is included. Throughout his artistic career, Krige was fascinated by the forms and textures of trees. He drew a vast array of trees in many terrains such as the Kalahari, the Namibian desert, in Botswana and in the Koo Valley near to Montagu, where he lived. Francois Krige was also a war artist during the Second World War and in order to escape the many horrors of war, Krige would resort to painting landscapes that spoke of the tragedies during this time. The oldest painting featured in The Benediction of Shade is Sangro Valley sketched painting in 1944 when Krige was in Italy. Krige signed up as a war artist in 1941 and for the first few years he spent much time working in North Africa in the desert war. However, in 1944 when the Allied forces invaded Italy, he joined a convoy that was destined for this Axis country. Krige was shocked by the devastation he witnessed in Italy and was moved by the residents’ plight. As Justin Fox has explained, “In the countryside the peasants tried to conduct a normal life and continued to bring in the olive crops” despite the great loss of loved ones and the devastating effects the war had on the landscape. In order to escape the suffering he was experiencing, Krige found a way to the nearby town of Vasto, a fishing village in Italy. This little village had managed to keep the charm of a Mediterranean fishing centre and here Krige was able to paint brightly coloured fishing boats and depicted the scenic vistas as land met the Adriatic Sea. After returning to South Africa, Krige spent some time living with his parents in Constantia, Cape Town. This was in the late 1940’s and early 1950’s when Constantia was still a rural farming community and not the residential area that it has now become. During this period Krige painted Pagasvlei, Constantia. It is a watercolour depicting farm folk resting under the shade of a willow tree. It is quite apt for the name of this exhibition, The Benediction of Shade. There are underlying implications in this watercolour as some of the figures are resting in the shade of the tree whilst one figure is working. Later in Francois Krige’s life he and his wife Sylvia would annually travel into the Northern Cape in their kombi on artistic expeditions. On some of these trips they would continue to the Gemsbok Park in the Kalahari. It was there in the Kalahari Desert that Krige would frequently draw Acacia trees, an example of this being Acacia and Rocks drawn in 1984 on one of these expeditions. He has captured the form of these trees with strong outlines and subtle sections of shading. Krige enjoyed venturing into the desert where he would sketch plants that managed to survive the barren and hazardous conditions of the Kalahari. These included the famous Welwitschia, otherwise known as the ‘desert octopus’, kokerbooms, euphorbias, tiny succulents and, whenever the opportunity presented itself, the Baobab commonly referred to as ‘the upside down tree’. Krige’s Post-Impressionist style allowed him to approach his tree subjects with an individual handling of line and texture. During much of his life, Krige loved to spend time painting in areas close to his home town of Montagu in the Western Cape. One of these areas was Kogmanskloof. Krige’s wife, Sylvia, often remembered him setting out early in the morning to explore Kogmanskloof where he would find a new composition that stimulated him. The unusual rock formations with trees and plants situated amongst these formations made for fascinating tableaus. This setting also suited Krige’s style of painting that was similar to that of the Post-Impressionists, in which objects painted in hot colours approached the viewer and objects painted in cool colours receded. The bright red rocks, the vital blue sky and the intense green of the trees all lent themselves to this style of painting. Sylvia and Francois Krige’s friends, the Pienaars, had a farm deep in the Koo Valley. Every winter the Kriges would look after the farm whilst the family was away and it made for a perfect place for Francois to go exploring. Tolbos was painted on the mountain slopes of the Pienaar’s farm. This painting is an excellent example of Krige’s Post-Impressionist and Impressionist style of painting. The strong and vivid colours attract the viewer immediately and draw them into the depicted landscape. The flattened background creates tension between the two-dimensional and three-dimensional space. There are echoes of Paul Cezanne in this painting, even though Krige’s “intentions remained more realist than Cezanne’s”. The imagery of trees has been an integral part of Francois Krige’s career as an artist. It is fascinating to see how he was continually drawn to them throughout his life, including them in all the landscapes that he came to appreciate. 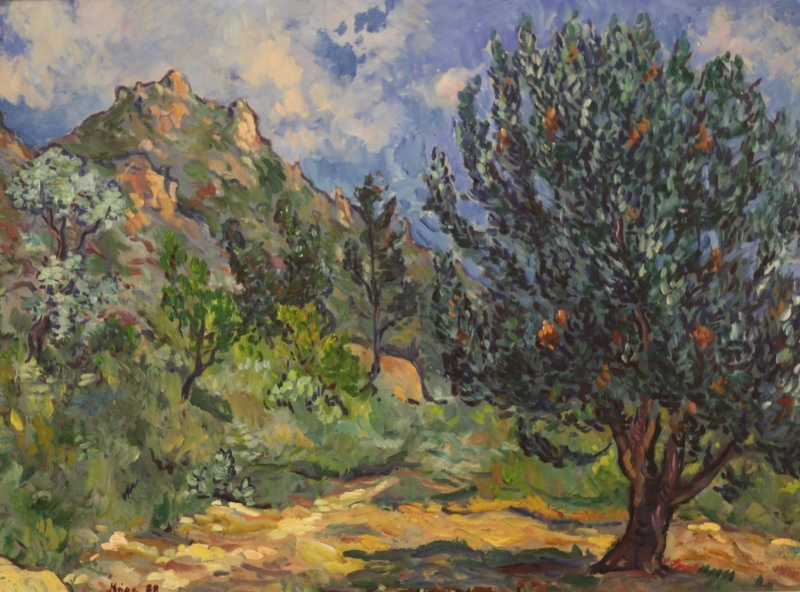 He was particularly interested in the flora of the more rugged landscapes such as Namibia and the Kalahari, while some of the most vivid paintings featuring trees are those depicting the Koo Valley. It is impressive to witness how balanced the trees are in these compositions and one hopes that these beautiful depictions of a natural world that is fast disappearing will continue to enlighten viewers for generations to come. Fox, Justin, The life and art of Francois Krige (Ferndale Press, 2000). A ‘kombi’ is a South African name given to a large family vehicle.